It’s hard to overstate what a wasteland the entry level suit market was a decade ago. When I was coming out of college (more than a decade ago! ), nearly every guy I knew was going to Joseph A. 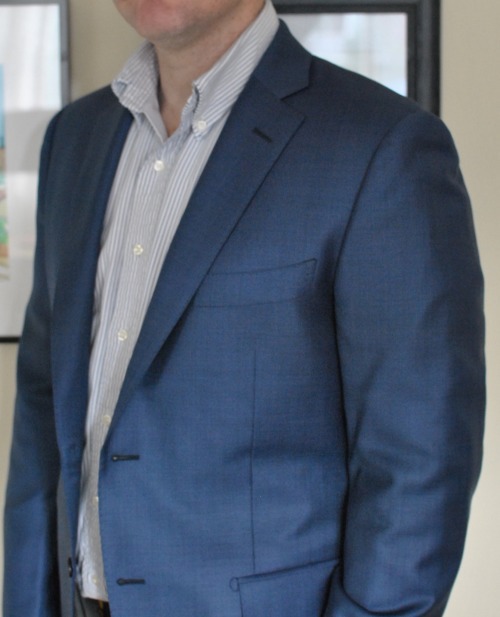 Bank or Brooks Brothers (if they had a little more scratch) for their “interview suit.” I wanted a nicer suit myself, but I was working as a bartender and felt $250 was a stretch, let alone $500–I ended up with a boxy 3-button number from Joey Banks (on sale!). Not much has changed. 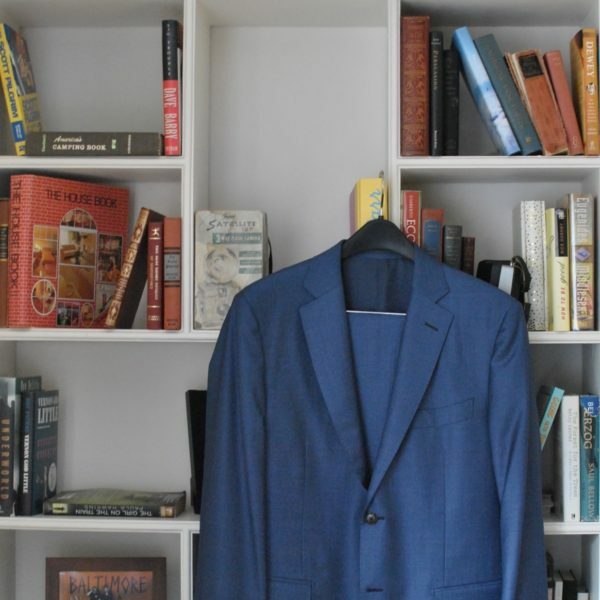 A few years back, Derek wrote a great guide to first suit choices at any price level–there were only two options at $500 or less. 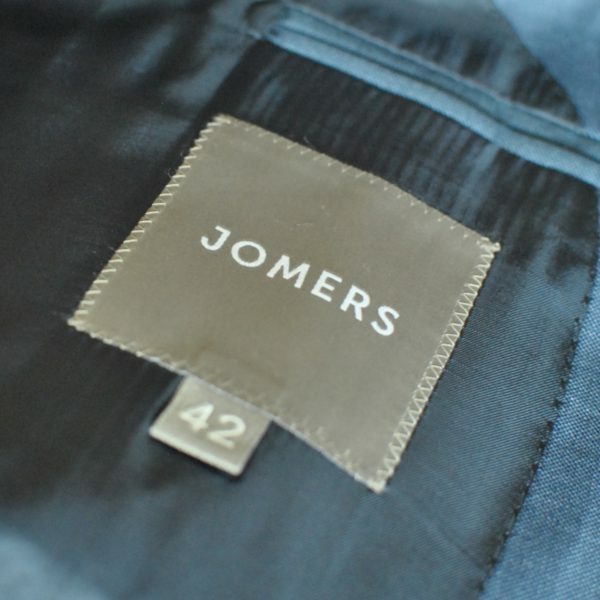 So I was glad to read about Jomers suits, which intend to offer higher quality and more modern styling at a consistent price of $250, about the same price as the current model of my old Joseph A. Bank suit. 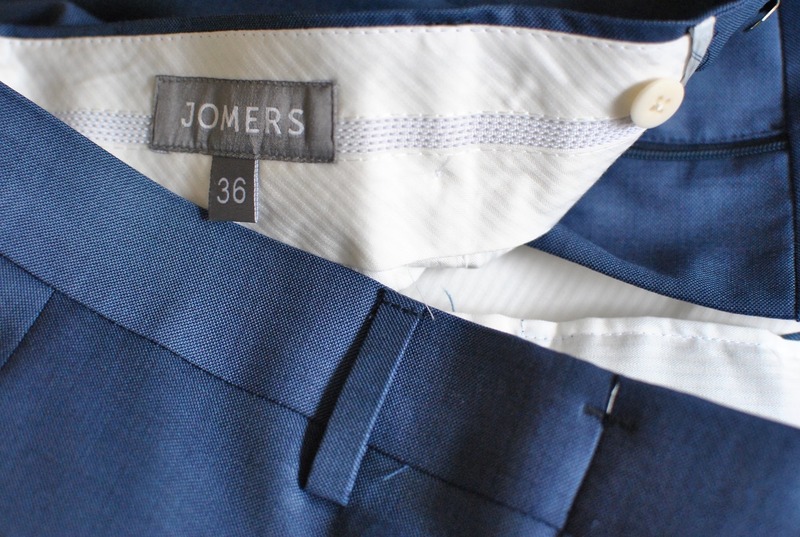 (Jomers also makes trousers, shirts, and polos, all in a modern, trim, generally Italian style.) 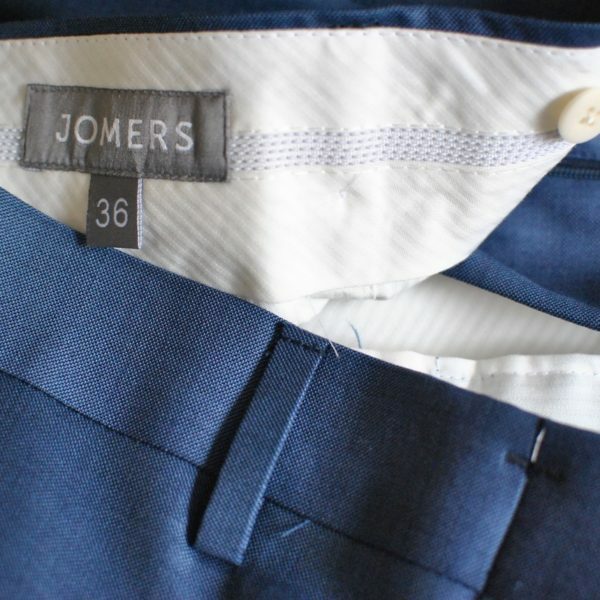 Jomers sent me two suits to review and try on, and I talked over email with Jomers’ CEO Meyer Dagmy. So what can you get for $250 these days? 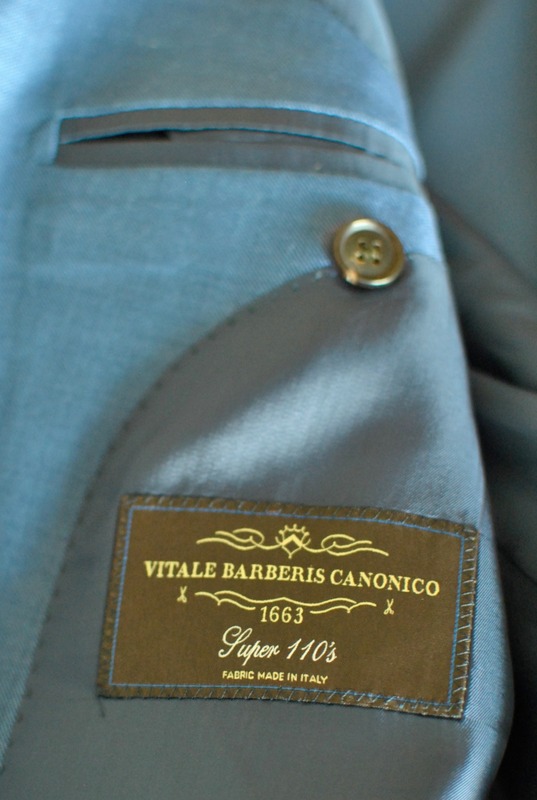 The Jomers suits I received were both in 100% wool, Italian fabric from Vitale Barberis Canonico, one in a lighter blue and one in navy with a little tonal variation (you can see my natural light photos of both above–closeups of the jacket are the darker blue). The fabrics are certainly nicer than what you’d find in a mall–more depth to the color, more interesting weave, and they hang well. They seem about in line with SuitSupply, which is our usual recommendation for suits <$500 and the line you most often see Jomers compared against. The construction and quality is solid for the price. They’re half canvassed, which is a measure of quality you may not appreciate until you’ve worn the suit a decent amount (for what it’s worth, my 2000s Joseph A Bank suit eventually got the dreaded bubbling in the chest and lapel as the fusing fell apart–suits that are half canvassed have a better reputation). 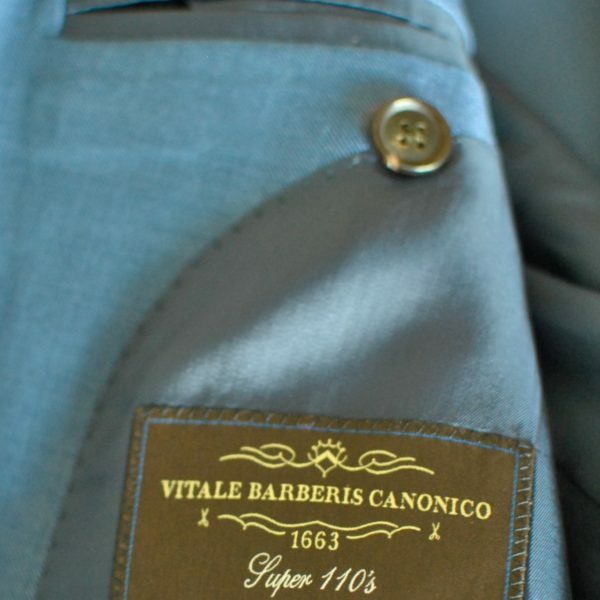 The suits are mostly machine made (not a criticism–you won’t find a lot of handwork in off-the-rack suits under $1000). Meyer told me that there is some hand stitching in the shoulder, as well. 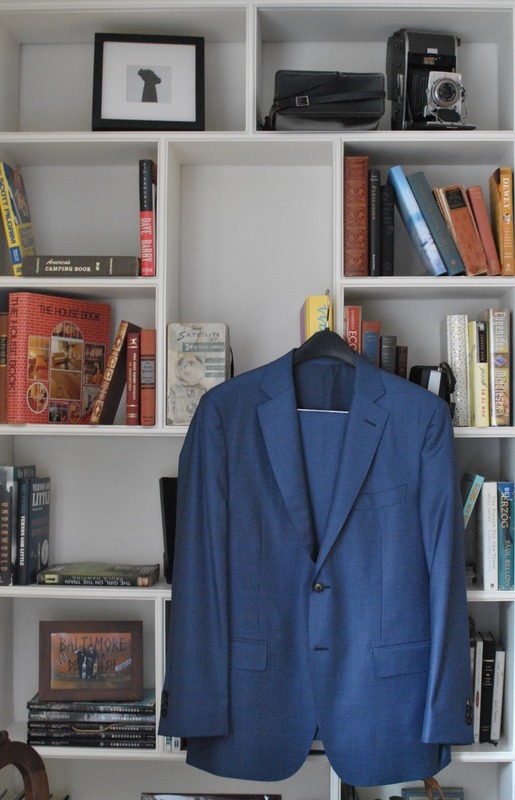 The Jomers suit wasn’t stiff out the box and the lapels and body were shaped well–without a long-term test it would be hard to know how it would break in. I did see a few loose stitches here and there, but nothing structural. I’ve seen some complaints online that the suits arrive wrinkled, but that seems like a ridiculous thing to complain about. You should expect to get any off-the-rack suit altered, and your tailor can steam or press the suit. Jomers cuts a modern suit in a style that should suit most young-ish guys who want a slim suit for work or formal-but-not-too-formal occasions. The suits are two-button, single breasted, with flap hip pockets and double vents. The lapels are a moderate width and the gorge is on the higher side. They have a barchetta-shaped breast pocket (not as exaggerated as I’ve seen on some Italian jackets). Trousers are a standard drop six (e.g. a size 40R jacket comes with 34 waist pants), flat front, trim, and tapered. They have a split waistband in the rear, which in my experience helps the waist give a little with movement. Jomers’ model is pretty much exactly what you’re looking for in a first suit. A current-looking suit that doesn’t take a lot of chances. If the only suit in your closet has a ticket pocket, contrast stitching, and a peak lapel, you overdid it. 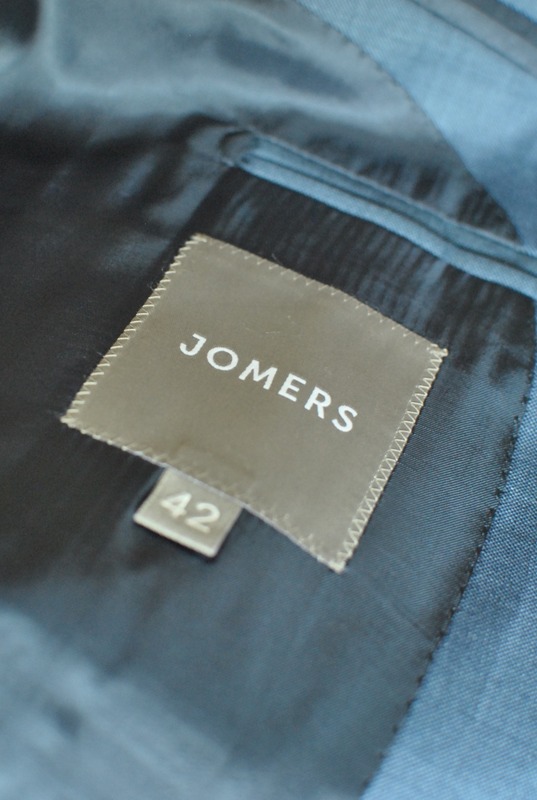 Jomers suits are restrained in that aspect–although they do offer a more casual model with patch hip pockets. 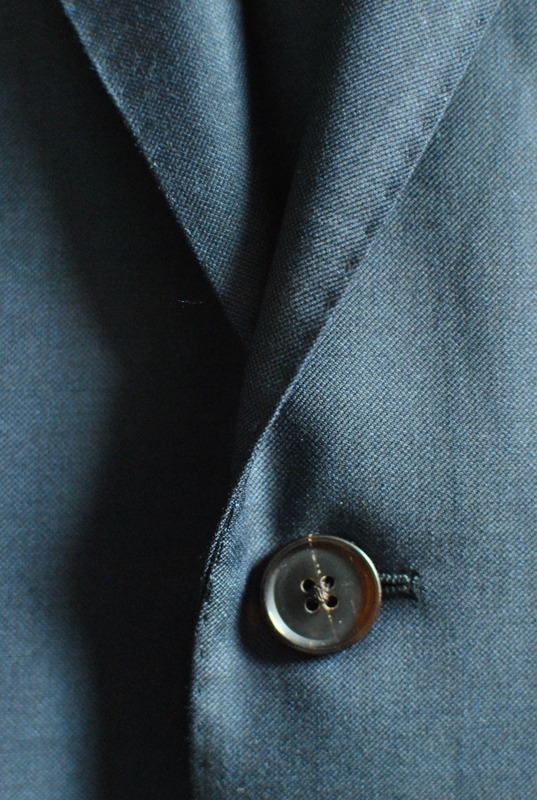 The horn buttons complement the fabrics and the lining is industry standard Bemberg (pants are lined as well). Jomers suits feature pick stitching (a decorative line of edge stitching in places like the lapel and pocket flaps), a detail that in the past was seen on higher-priced suits that you see more often these days–sticklers for conservative dress might find it overly decorative. 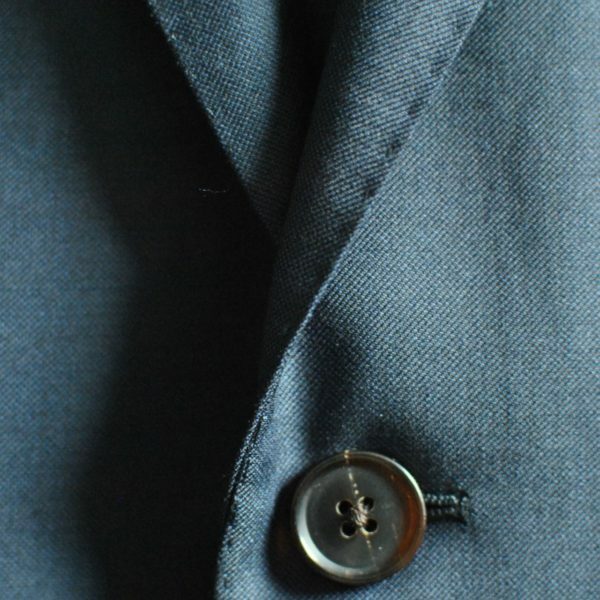 A competent alterations tailor can tweak some of the fit of a jacket (which anyone buying a new off-the-rack suit should account for, in time and money). Take care, however, that a new suit fits how you like in the shoulders and chest, which are a challenge if not impossible to alter significantly. I’ve tried SuitSupply’s Napoli and Sienna models in 42 as well, and I found Jomers’ suits to be slightly tighter in the chest and waist. Meyer told me that some customers have said Jomers suits aren’t as trim as they’d like–based on the suits I tried that surprises me. Currently, the suits are offered only as a jacket with the accompanying drop-six trousers. Jomers plans to offer separates in the future to allow customers to order trousers in a different size, and may do so in their next run (slated for January 2018). The trousers fit me rather well. I wouldn’t alter a thing except have the hems finished. I found the rise on the trousers to be neither very high nor very low. One thing Joe Banks and Brooks have going for them is they’re in every decently sized city. Walk in and you can try stuff on, and even line up alterations. Jomers is able to offer their suits at such a low price at least in part because they don’t have to pay for retail spaces and sales associates all over the place. The upside for customers is obvious–you can get a suit that might otherwise be out of your price range. The trade off is that you have to order online without trying on, and in Jomers’ case the supply and demand are such that you pretty much have to order as soon as wares become available (stuff sells out quickly). Meyer told me they intend to double the number of units available in the next batch, which had 200-250 suits available in each fabric. Jomers offers free shipping, and has a 14-day full-refund return policy (buyer pays return shipping). So the only real risk in ordering is that the suit you want may not be available when your return is complete. If I were ordering a Jomers suit today, I would likely order my usual size and one size up, then return the size that didn’t fit as well, and factor the return shipping cost into the cost of my suit. We generally recommend you save to buy what you really want, and recommend a lot of tailoring that requires some investment. But many guys just aren’t ready to buy a $500+ suit. Jomers solidly fills a niche for people who want better fabric and non-stodgy styling at a price that doesn’t assume you already have a six-figure salary.